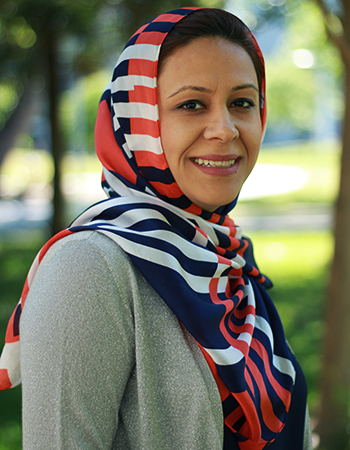 Shokoufeh Jashnani earned a Bachelor of Science in Nursing from her native country of Iran, but she sought out Stan State to help her achieve her ultimate professional goal of becoming a nursing instructor, for which she needed a master’s degree. “In order to advance my degree, I decided to become a student in the U.S.,” Jashnani said. Not only did Jashnani take volunteer nursing jobs while she worked on her English and studied for the nursing license exam (which she passed), she held a full-time position as an RN in a local, long-term acute care facility while she worked toward her master’s in nursing. The whole time, Jashnani focused on her English skills. She was nominated to be the School of Nursing Graduate Standard Bearer for the 2017 Commencement. Working as an RN and pursuing her degree simultaneously gave Jashnani a fresh outlook on learning. She was able to immediately see the benefits of her education and apply some of the concepts she was leaning as a student toward her work. “To students who are not working as a nurse, this might not apply yet, but they will see the benefit later when they are starting to work in nursing,” Jashnani said. Even though Jashnani is far from her hometown, she doesn’t intend on leaving the region anytime soon. She notes the nationwide shortage of both working nurses and nursing educators. “No matter what kind of degree you get in the field of nursing, it is going to be used in hospitals, universities and colleges,” she said. Her specific goals are to be a clinical instructor at the university level, or to become a nurse educator in a hospital. “Dr. Carolyn Martin supported me in every way she could and helped me with a lot of patience and kindness in my master’s program. I do believe without her support I would have not have been able to achieve what I have in my master’s program. I learned a lot from her and she has truly become my role model. When it comes to teaching and caring for students, she was one of those professors that did not quit until she knew you understood the subject very well. I also would like to thank Dr. Marla Seacrist for her help and patience."